Ford warns travelers that fatigue is a major factor in up to 1 in 5 road crashes. To help study this, Ford has commissioned the creation of a “sleep suit” that simulates what happens when people become “zombie drivers.” Often times, people fall asleep for very short periods of time, otherwise known as ‘microsleeps’, which can be extremely dangerous behind the wheel, for obvious reasons. This sleep suit from Ford simulates tired driving in a number of ways as part of a study involving the driving habits of young people. 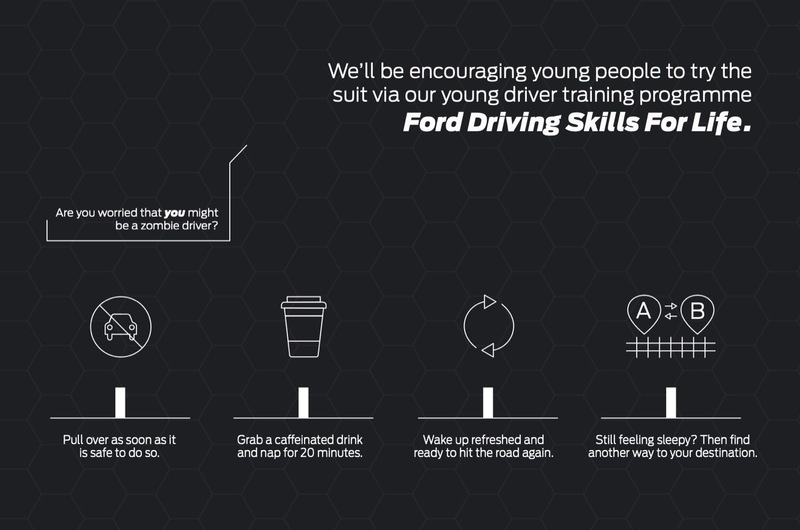 Ford emphasizes that transportation accidents are the leading cause of death among young people which is why the company is integrating the sleep suit into Driving Skills for Life (DSFL). DSFL is a free young driver training program for young people ranging from 17 to 24 years old. Check out the above video that explains all of the elements of the suit including a weighted vest, wrist and ankle weights, and specially designed classes that simulate closing your eyes for brief periods of time. Ford notes that remaining awake for periods in excess of 18 hours can impair driver abilities to a degree which is comparable to exceeding the drinking and driving limit in many countries. The above diagram from Ford explains some tips for safer driving when tired or sleep deprived. The biggest recommendation which isn’t listed above is to get 7 to 9 hours of sleep per night to ensure that you are being safe on the road.